This is the third part in the series on configuring the VNXe via command line. Here I will detail the Steps involved in adding VMware ESXi hosts, presenting NFS datastores to these hosts and setting access rights. Note: VMWare networking and Nexus port channels must be configured at this stage. See below for example NEXUS VPC configs. Operation completed with partial success. The create, refresh, or set operation has started. 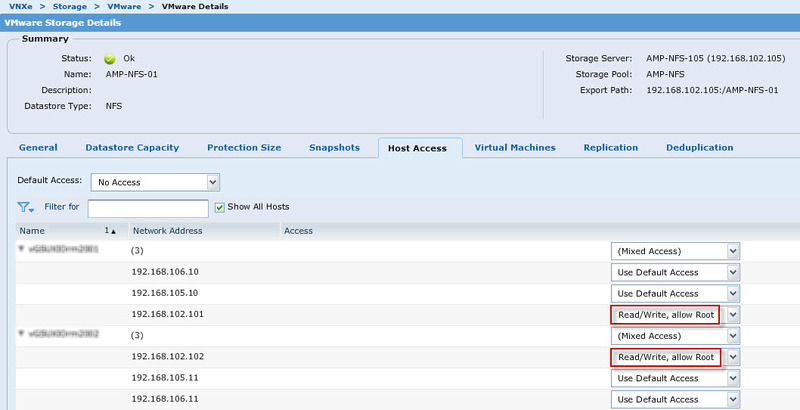 It will continue to add or update ESX host information in the background. Three IP addresses are returned, in this case there is one IP address each for Mgmt, VMotion and NFS traffic. We are only concerned with applying access permissions at the NFS level. In this example the NFS addresses are 192.168.102.101&102.